So we’re cooking dinner (shrimp salad in case you wondered) and this commercial comes on for Golden Corral showing their new chocolate fountain. Me: I would totally eat that. Rich: Me too. I’d be like in Willy Wonka! Rich: Veruca Salt never ate the chocolate. It’s Augustus. Me: Well, I can’t do the guy’s voice that has to be you. Rich: Oh great, so I’m the fat German kid? I’m doing an article on fur boots for one of the companies I write for. I am including faux fur and real fur only as a choice for those that want to read about it. Me: These Fendi boots are over $1700 in American money and £1100 in UK money and they are raccoon fur. They don’t even say if the raccoons are treated humanely or if they are killed for the fur. Rich: How do you think they get the fur from the raccoon? Me: Maybe they shear them. Rich: They only shear sheep as far as I know. PS do not try to look this up and see for yourself or you’ll only see awful sites from PETA that you don’t want to hear about. In my defense, I didn’t know about bunnies dying in the 80’s for my pimpin’ jacket. I was talking to a friend about someone sending her some money and she had expected much more. Me: I bet she built that all up too, didn’t she? Me: I call that the troll syndrome. When I worked at the newspaper years ago this guy liked me and said he had a gift for me. He built it up all week long and do you know what it was when I got it? 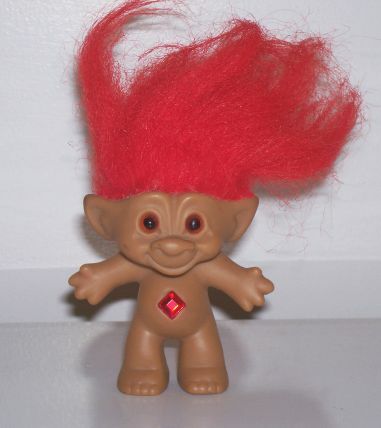 Me: A freaking troll doll. You know those kind you put on a pencil with the big hair? That’s what he gave me as a gift. My freaking gift. I mean, really? Rich: What kind of tires did that truck have? Me: I have no idea but it sounded like an alien ship. Rich: I’m glad I wasn’t the only one thinking that. A conversation we had the other night going down the road. I was flipping channels on the Sirius radio and came across Philadelphia Freedom by Elton John on the 70’s station. Me: This song has a special place in my heart. Remember why? Me: Yeah remember? The first time we got HBO hooked up years ago this was the first thing playing. It was Elton John in Central Park and he was playing this song. Rich: *sarcastic* Mmmm, kay. That’s lame. Me: HBO is not lame! About this time another song comes on which was Slow Ride by Foghat. Me: Oh lookie, you can tell me how you played this song over and over at Miracle Strip! That’s your special memory. Rich: Hey dumbass, it’s a sportscar, the gas is on the right, use it. As you can read, the conversation moved on to other subjects.